You won't believe it, but could eat off the floors here! Glad they found the problem early! You do fantastic work and are pleasant. The One Top Shop for a reason. Everyone is pleasant and great loaner car program. Quick - Professional, we appreciated it. Quick. My son had to go back to school and we could not find a dealership that could get him in. Menkes got him in that day. They fixed it quickly and we appreciate it very much. You did the job right and I appreciate it. First time customer! 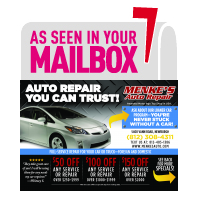 Menke’s gives you reliable, friendly and honest service. We take the time to explain the repairs and show you the damaged parts. Our state-of-the-art facility services: domestic & foreign cars and trucks, as well as commercial fleets.